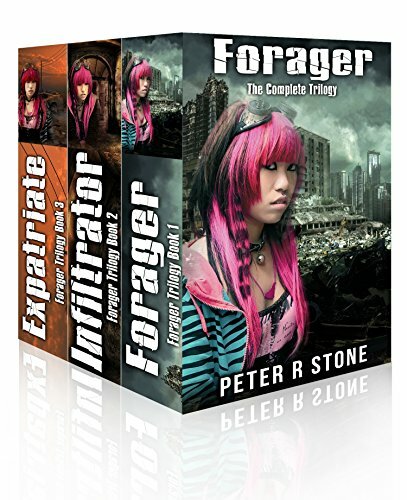 Forager - the Complete Trilogy - includes: Forager, Infiltrator, Expatriate. A century after an apocalyptic war devastates the planet and reduces all countries to smouldering ruins, Melbourne’s remnant population huddles behind twelve-foot walls. But are these walls for protection from the Skel savages who roam the city’s ruins, or to imprison the people and subject them to archaic rules enforced by the ruthless Custodians. Mutants aren’t tolerated, you can’t leave the town, women should be seen and not heard, and if you break the law, you’ll be sentenced to hard labour or swiftly executed. Eighteen-year-old Ethan Jones is the leader of a foraging team whose skills are paramount to the community’s survival. His success is due to a secret he harbours and the Custodians are growing suspicious, for his mere existence is a violation. When Ethan’s team rescues a Japanese girl from the Skel, he brings her back with them. He finds her unlike anyone he’s ever met and her steely determination completely captivates him. The feeling’s mutual but she breaks the town's rigid conventions in her attempts to get to know him, endangering them both. Making matters worse, the Skel have intensified their attacks on foraging teams and are infesting Melbourne's ruins in ever-greater numbers.